In 2004 the LDS Church brought its long-running City of Joseph pageant (Nauvoo, Illinois) to a close. In 2005 a new pageant premiered in the City of Joseph — Nauvoo Pageant: A Tribute to Joseph Smith. Along with the introduction of the new pageant, the LDS Church also offered tourists several historic vignettes which were performed at various times and locations around Nauvoo by pageant actors. One of these vignettes was of special interest to me: King Follett Discourse. In this vignette Dallyn Bayles, the actor portraying Joseph Smith in the pageant, was to deliver portions of the famous sermon as Joseph Smith did in 1844. I went to the grove to watch and listen, bringing a copy of the King Follett Discourse text for comparison. I had expected a cleaned-up version of the sermon, with all the references to men becoming Gods and the council of the Gods (etc.) removed. I was happily surprised when Mr. Bayles did not shy away from much of the content of the sermon that is contradictory to Christianity. Though the sermon was edited for the sake of time, the true nature of the sermon was left intact. That was in 2005. This year, 2006, I again attended the King Follett Discourse vignette. Mr. Bayles delivered a compelling performance which elicited many positive comments from the audience. Again I was surprised by the content of the sermon, but this time not happily. This time the sermon had indeed been sanitized. All of the openness of Joseph Smith’s teachings displayed in 2005 was gone. The Prophet Joseph Smith will share portions of one of his last major discourses, a funeral sermon given in honor of Brother King Follett. In this speech the Prophet shared profound insights on the nature of God and the immortality of man. Now look at what was left out of this portion of the sermon. …it is necessary that we should understand the character and being of God, and how he came to be so; for I am going to tell you how God came to be God. We have imagined and supposed that God was God from all eternity, I will refute that idea, and will take away and do away the veil, so that you may see. These are incomprehensible ideas to some; but they are simple. It is the first principle of the Gospel to know for a certainty the character of God and to know that we may converse with him as one man converses with another, and that he was once a man like us; yea, that God himself the Father of us all, dwelt on an earth the same as Jesus Christ himself did; and I will show it from the Bible. I wish I was in a suitable place to tell it, and that I had the trump of an archangel, so that I could tell the story in such a manner that persecution would cease for ever. What did Jesus say? (Mark it, Elder Rigdon.) The Scriptures inform us that Jesus said, “As the Father hath power in himself, even so hath the Son power”–to do what? Why, what the Father did. The answer is obvious–in a manner, to lay down his body and take it up again. Jesus, what are you going to do? To lay down my life, as my Father did, and take it up again. Do you believe it? If you do not believe it, you do not believe the Bible. The Scriptures say it, and I defy all the learning and wisdom and all the combined powers of earth and hell together to refute it. Here, then, is eternal life–to know the only wise and true God; and you have got to learn how to be Gods yourselves, and to be kings and priests to God, the same as all Gods have done before you,–namely, by going from one small degree to another, and from a small capacity to a great one,–from grace to grace, from exaltation to exaltation, until you attain to the resurrection of the dead, and are able to dwell in everlasting burnings and to sit in glory, as do those who sit enthroned in everlasting power. To inherit the same power, the same glory and the same exaltation, until you arrive at the station of a God, and ascend the throne of eternal power, the same as those who have gone before. In the beginning, the head of the Gods called a council of the Gods; and they came together and concocted a plan to create the world and people it. God never had the power to create the spirit of man at all. God himself could not create himself. God himself, finding he was in the midst of spirits and glory, because he was more intelligent, saw proper to institute laws whereby the rest could have a privilege to advance like himself. These are just a sampling. Joseph Smith indeed taught “profound” doctrines on the nature of God via the King Follett Discourse — doctrines Mormonism still embraces today. 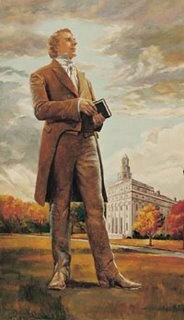 Why do you suppose the LDS Church wasted the opportunity to share what they believe to be Joseph Smith’s prophetic insights on the nature of God with the vignette audience in Nauvoo? To see scanned images of the entire King Follett Discourse from an LDS source click here. This entry was posted in God the Father, King Follett Discourse, Nauvoo. Bookmark the permalink. EXCELLENT blog, keep it up. Yes, this type of thing makes me gravely sad (as one who is delighted by the true history and teachings of the Church). Omissions and sanitization will be the undoing of many Saints, as they begin to feel “betrayed” because of it. The Internet opens vast amounts of knowledge to our view, and pretty soon the sweeping under the carpet technique will begin to look utterly ridiculous — to investigators and converts — not just to those seasoned with LDS culture and beliefs. Really? That’s great. I like [the subject of] rewriting history. That’s why I liked “1984,” communist propaganda, liberal dogma, and a number of religious sects and political pests. But, say, could you provide the full text of the improved discourse? Did it suffer omissions only, or also transformations? As far as I could tell, the text of the King Follett Discourse was edited, not changed. Sorry — no full text as edited available.